Americans own guns for a variety of reasons, and the ways in which they use their guns differ. Gun use also varies along key demographic, social and attitudinal dimensions. Overall, about a third of gun owners say they go hunting often (12%) or sometimes (22%), while roughly half say they go shooting or to a gun range with some frequency (13% often, 40% sometimes). Among those who own a handgun, roughly one-in-four (26%) carry their gun with them outside of their home all or most of the time, and an additional 31% say they carry some of the time. Gun owners are divided when it comes to how important owning a gun is to their overall identity. One-in-four say it is very important, while the rest view this as somewhat important or not important. Those who say being a gun owner is very important to their identity are nearly unanimous in their belief that the right to own a gun is essential to their personal freedom. Many, but not all, gun owners exist in a social context where gun ownership is the norm. Roughly half of all gun owners say that all or most of their friends own guns. An additional 38% say some of their friends own guns and 13% say only a few do. In stark contrast, among the non-gun owning public, only one-in-ten say all or most of their friends own guns. These social connections are strongly tied to gun use, as gun owners who say all or most of their friends own guns engage more frequently in hunting and sport shooting than those with fewer friends that own guns. The broader gun culture in the U.S. extends beyond hunting and shooting to clubs, associations and media and entertainment outlets. About a third or more of gun owners say they often or sometimes watch TV programs or videos about guns or visit websites about guns, hunting or other shooting sports. Younger gun owners are among the most likely to consume some types of gun-related media. 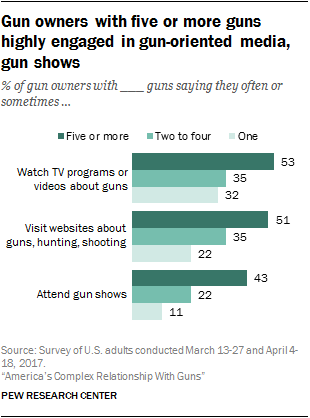 Among all gun owners, about one-in-four say they often or sometimes attend gun shows. Men and women who own guns interact with them in different ways – with male gun owners hunting and shooting more frequently than their female counterparts and consuming some forms of gun-oriented media at higher rates. There are also differences by age and educational attainment in the extent to which guns are a part of the day-to-day lives of gun owners. For today’s gun owners, the right to own guns nearly rivals other rights laid out in the U.S. Constitution in terms of its personal salience. About three-quarters of gun owners (74%) say this right is essential to their own sense of freedom. Among those who do not own guns, only 35% view the right to own guns as an essential right. Gun owners and non-owners tend to agree on other top-tier constitutional rights. Roughly equal shares say freedom of speech, the right to vote, the right to privacy and freedom of religion are essential to their own sense of freedom. Views on the essential nature of the right to own guns are linked both to current gun ownership and personal history. Gun owners who grew up with guns in their household are among the most likely to say the right to own guns is essential to their personal sense of freedom – 79% hold this view. Gun owners who did not grow up with guns feel less strongly about this; 65% say the right to own guns is essential to their sense of freedom. 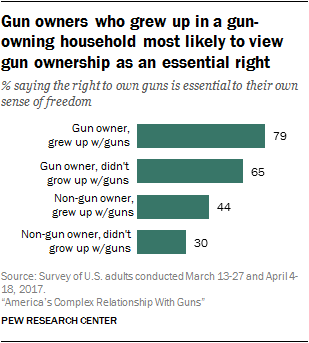 Similarly, among non-gun owners, 44% of those who grew up with guns view the right to own guns as essential, compared with 30% of those who did not to grow up in a gun-owning household. Partisanship and ideology are strongly correlated with views about the importance of gun ownership as a guaranteed right. And those differences hold up among gun owners and non-owners alike. For Republican gun owners and independents that lean Republican, gun ownership is nearly on par with free speech, the right to vote, the right to privacy and freedom of religion. Among conservative Republican gun owners (and Republican leaners), 95% say the right to own guns is essential to their own sense of freedom. Somewhat fewer (86%) moderate to liberal Republican gun owners view the right to own guns as essential to their freedom. Roughly seven-in-ten (69%) conservative Republicans who do not own guns view the right to own guns as essential. Among moderate and liberal Republicans who don’t own guns fewer (53%) hold this view. Among conservative and moderate Democrats and independents that lean Democratic, gun owners are twice as likely as non-owners to say the right to own guns is essential to them (50% vs. 25%). 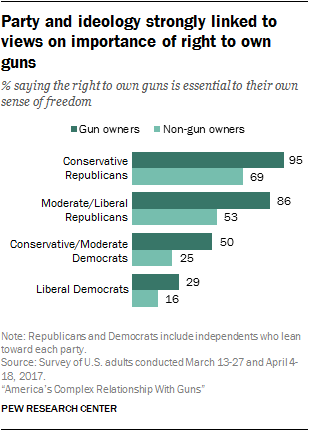 Relatively few liberal Democrats view the right to own guns as essential to their freedom, but the gun owners among this group are significantly more likely than non-owners to hold this view (29% vs. 16%). America’s gun owners are divided over whether owning a gun is central to who they are. Some 25% say this is a very important part of their overall identity and another 25% say it is somewhat important. At the same time, fully half say being a gun owner is not too important to their overall identity (30%) or not important at all (20%). Roughly equal shares of men and women who own guns say being a gun owner is very important to their identity. 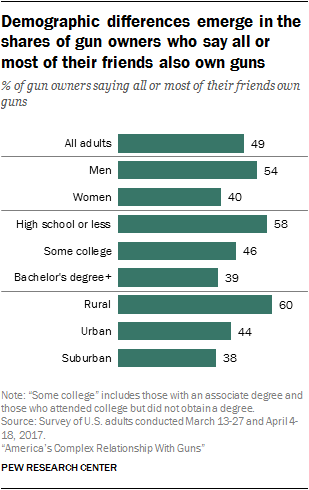 Gun owners with a high school diploma or less education are significantly more likely than more educated gun owners to view gun ownership as central to who they are – 34% of those with no formal education beyond high school say this is very important to their overall identity, compared with 20% of those who have attended or graduated from college. Republican gun owners are nearly three times as likely as Democrats who own guns to say owning a gun is very important to their overall identity: 31% of Republicans or independents who lean Republican say this, compared with 12% of Democrats and independents who lean to the Democratic Party. In addition, gun owners who own five or more guns see a stronger link between their gun ownership and their overall identity. Among those who own five or more firearms, 42% say being a gun owner is very important to their overall identity. Only 21% of those who own two to four guns and 15% who own one gun say the same. Similarly, gun owners who have strong social ties to other gun owners are more likely than those with fewer ties to see their gun ownership as important to their identity. Some 35% of those who say all or most of their friends own guns also say being a gun owner is very important to their overall identity, compared with 19% of those who say some of their friends own guns and only 3% of those who say only a few or none of their friends own guns. When it comes to their social circles, about half of gun owners (49%) say that all or most of their friends also are gun owners, and another 38% say some of their friends are; just 13% of gun owners say only a few of their friends own guns and virtually no gun owners (less than 1%) say that none of their friends do. In contrast, only one-in-ten adults who don’t own guns say all or most of their friends are gun owners; 37% say some of their friends own guns, while 32% say only a few do and 21% say none of their friends own guns. Perhaps not surprisingly, since gun ownership is more common in rural parts of the country, gun owners who live in such areas are far more likely than those who live in a suburb or urban area to say all or most of their friends also own guns. Six-in-ten gun owners in rural areas say this is the case, compared with 38% in suburban and 44% in urban areas. Non-gun owners in rural areas are also somewhat more likely than those in other types of communities to say all or most of their friends own guns, though relatively few non-gun owners in rural (16%), urban (7%) or suburban (9%) areas say this is the case. Among male gun owners, 54% say all or most of their friends also own guns; smaller shares of women who own guns say this is the case (40%). It is also more common for less-educated gun owners to socialize with other gun owners: 58% of those with a high school diploma or less say all or most of their friends also own guns, compared with 46% of gun owners with some college and 39% of those with at least a bachelor’s degree. Eight-in-ten gun owners say they don’t mind if other people know they own a gun, but don’t go out of their way to tell them; 14% say they’d rather other people not know that they own a gun and 6% want others to know. Answers to this question don’t vary significantly across demographic groups or party lines. About half of gun owners say they often (13%) or sometimes (40%) go shooting or to a gun range. Some 30% say they rarely go shooting and 18% say they never do. 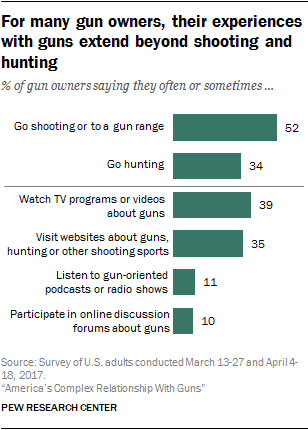 Hunting is less common: Roughly a third of gun owners say they often (12%) or sometimes (22%) go hunting. Some 22% say they rarely go hunting and 44% say they never do. 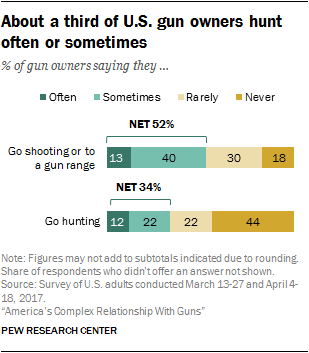 Among non-owners who say they have shot a gun at some point, 6% say they often or sometimes go shooting or to a gun range and 5% say they go hunting at least sometimes. When it comes to hunting, there’s a gap among gun owners, although it’s relatively modest: 37% of male gun owners say they go hunting often or sometimes, compared with 28% of female owners. Republican gun owners and independents that lean Republican are more likely than Democratic gun owners and Democratic-leaning independents to say hunting is a major reason they own a gun, and there is a similar party gap in which group hunts more frequently. Roughly four-in-ten Republican gun owners (39%) say they hunt at least sometimes, compared with 24% of Democrats. Gun owners who grew up with guns in their household are about twice as likely as gun owners who did not grow up with guns to say they often or sometimes hunt (41% vs. 19%). 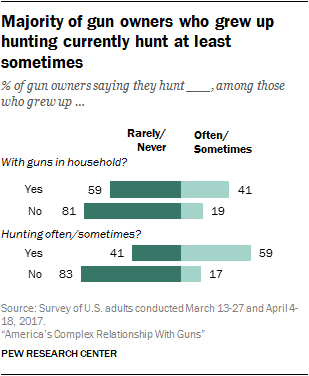 And among gun owners who say they hunted at least sometimes when they were growing up, roughly six-in-ten (59%) say they still hunt at least sometimes. Relatedly, gun owners living in rural areas – who are more likely to have hunted when they were growing up – report hunting at much higher rates than those living in urban and suburban areas. Roughly four-in-ten rural gun owners (42%) say they hunt often or sometimes, compared with roughly a quarter of those living in suburban and urban areas. Gun owners who hunt are far more likely than those who do not hunt to have five or more guns. Roughly two-thirds (67%) of those who hunt often own at least five firearms, compared with 46% of those who hunt sometimes, 27% of those who rarely hunt and 11% who never hunt. The gender gap in hunting can also be seen in sport shooting. Roughly six-in-ten male gun owners (58%) say they go shooting or to a range at least sometimes, compared with 43% of women who own guns. Among men and women, younger gun owners (those under age 50) are more likely than their older counterparts to say they often or sometimes go shooting. The partisan gap is similar as well. Even though Republican and Democratic gun owners are equally likely to say sport shooting is a major reason they own a gun, Republicans report shooting or going to a gun range more frequently than do Democrats (58% of Republicans vs. 42% of Democrats say they do this often or sometimes). Every state in the U.S. allows individuals to carry concealed weapons, although most require a permit in order to do so. And the open carrying of handguns in public places is permitted in a majority of states, again with certain restrictions which vary from state to state. About seven-in-ten gun owners (72%) say they own a handgun, and, of those, about a quarter (26%) say they carry it outside their home all or most of the time, with 11% saying they always carry a handgun. (This does not include times when they might be transporting the gun.) Roughly three-in-ten (31%) carry some of the time, and 43% say they never carry a handgun outside of their home. There is no gender gap in carrying a handgun – roughly equal shares of men and women who own a handgun say they carry outside of their home. And there are no significant differences by education, region or community type. There is, however, a partisan gap: Roughly six-in-ten (63%) of Republicans or Republican-leaning independents who own a handgun or pistol say they carry a handgun outside of their home at least some of the time, compared with 45% of Democrats or Democratic-leaning independents who own a handgun. Carrying a handgun is a much more common occurrence for those who say owning a gun is at least a somewhat important part of their identity than it is for other gun owners. Among handgun owners, about three-quarters (78%) who say owning a gun is very important to their overall identity say they carry a gun outside of their home at least some of the time. This includes 42% who say they carry all or most of the time. By contrast, roughly four-in-ten (42%) handgun owners who say owning a gun is not too or not at all important to their overall identity say they carry at least some of the time (14% of these handgun owners carry all or most of the time). Similarly, carrying a gun outside the home at least some of the time is more prevalent among gun owners who view owning a gun as essential to their personal freedom, than it is for other gun owners (63% vs. 36%). Handgun owners who live in communities they feel are unsafe tend to carry their guns with them more often. Among those who say their community is not too or not at all safe from crime, 41% of handgun owners carry their gun with them all or most of the time. Only about half as many (22%) of those who say their community is very or somewhat safe say they carry a handgun with the same frequency. Among handgun owners who say they never carry a gun outside of their home, a majority (64%) say the reason they never carry is because they don’t want to. Roughly a third (36%) say there is some other reason that they don’t carry. While the survey didn’t specifically explore these reasons, some explanations offered by gun owners in a series of focus groups include legal restrictions in the state where they live or that haven’t gotten around to fulfilling the necessary requirements to be able to carry legally. Democrats who own handguns but do not carry them outside their home are much more likely to say they don’t carry because they don’t want to – 76% of Democrats say this, compared with 56% of Republicans. Among Republicans who don’t carry outside their home, 44% say they have some other reason for not carrying; only 24% of Democrats who don’t carry say the same. Overall, 19% of all U.S. gun owners say they belong to the NRA. Among gun owners, roughly equal shares of men and women say they are NRA members, and there are no significant differences across age groups or by educational attainment. Across income groups, membership rates are highest among gun owners with annual household incomes of $100,000 or more. Roughly three-in-ten (29%) of these higher-income gun owners say they belong to the NRA, compared with 17% of those earning between $75,000 and $99,999 and an equal share of those earning less than $75,000. Republican and Republican-leaning independent gun owners are about twice as likely as gun owners who are Democrats and Democratic-leaning independents to say they belong to the NRA – 24% vs. 11%. And, among Republicans, conservatives have significantly higher rates of membership – 28% vs. 17% of moderate or liberal Republicans. The survey findings suggest that gun owners who strongly identify with their gun ownership are more apt to join the NRA. Among those who say being a gun owner is very important to their overall identity, 34% are NRA members. The share is smaller for those who say being a gun owner is somewhat important (18% belong to the NRA) or not important (12%). In addition, gun owners who got their first gun before they turned 18 are about twice as likely as those who first acquired a gun as an adult to belong to the NRA (27% vs. 14%). There is no clear public consensus about the impact the NRA has on the nation’s gun laws: 44% of all Americans say the NRA has too much influence, 40% say it has the right amount of influence and 15% say the NRA has too little influence. Among gun owners more say the NRA has too much influence (29%) than say it has too little (17%). For their part, gun owners who are NRA members are largely satisfied with the amount of influence the organization has over gun laws in the U.S. About six-in-ten (63%) say the NRA has the right amount of influence and 28% would like to see it have even more influence. 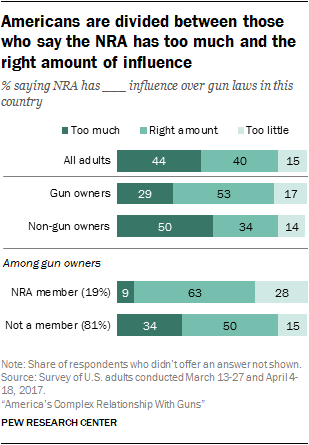 Only 9% of NRA members say the organization has too much influence over gun laws. Gun owners who are not members of the NRA are more likely than their counterparts who do belong to say the organization has too much influence over gun laws (34% say this). Relatively few gun owners say they are a member of a gun or shooting club or gun range (13%) or that they belong to a hunting club (5%). Membership in these types of establishments is more common among younger gun owners. Roughly one-in-five gun owners ages 18 to 49 (18%) say they belong to a shooting club or gun range, compared with 9% among those ages 50 and older. Among gun owners ages 18 to 29, 13% belong to a hunting club; only 3% of those ages 30 and older say they belong. Gun owners who go shooting frequently are particularly likely to be members of a gun or shooting club or gun range: 48% of those who say they go shooting often are members of these types of establishment, compared with 15% of those who go shooting sometimes and even fewer among those who rarely or never go shooting. However, membership in hunting clubs is relatively uncommon even among those who say they go hunting often: Just 12% in this group say they belong to a hunting club. Gun owners have a variety of options these days for pursuing their interest in guns – from websites devoted to guns and hunting, to podcasts, to gun shows. About four-in-ten gun owners say they often (8%) or sometimes (31%) watch gun-oriented TV programs or videos, and a similar share say they visit websites about guns, hunting or other shooting sports (8% say they do this often and 27% sometimes). Of course, all of these outlets are available to non-gun owners as well, and some do take advantage of them. 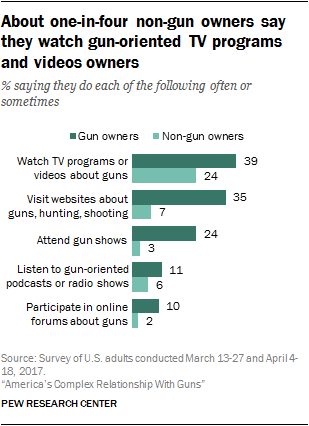 About one-in-four non-gun owners say they watch gun-oriented TV programs or videos often (5%) or sometimes (20%). Non-gun owners are much less likely than gun owners to say they visit websites about guns, hunting or shooting (1% often, 7% sometimes). There are significant gender gaps when it comes to consuming these types of gun-0riented media. While 43% of male gun owners say they often or sometimes watch gun-related TV shows or videos, 33% of female guns owners say the same. 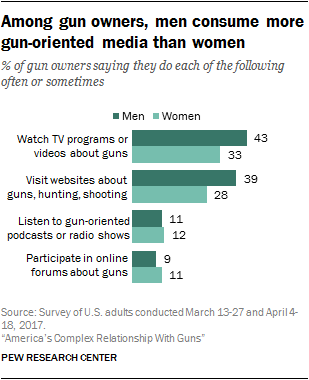 Similarly, when it comes to visiting websites with gun-related content, 39% of male gun owners say they do this at least sometimes, compared with 28% of female gun owners. Gun owners who say all or most of their friends own guns are more likely to watch these shows and videos – 44% say they do this at least sometimes, compared with 34% of those who say some, only a few or none of their friends own guns. Overall, about a quarter of gun owners say they attend gun shows often (4%) or sometimes (20%). 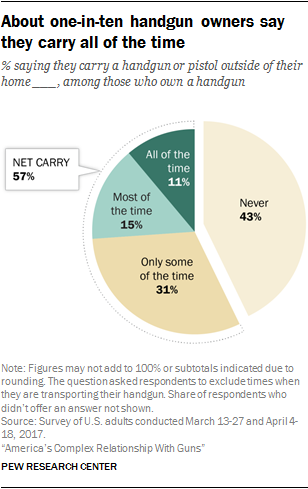 Roughly three-in-ten (29%) say they hardly ever attend gun shows and 47% say they never do. Among gun owners, men and women are equally likely to say they go to gun shows at least sometimes, but the education gap that is apparent on gun-oriented media can also be seen here. While roughly three-in-ten (28%) gun owners without a bachelor’s degree say they go to gun shows often or sometimes, only 14% of gun owners with a bachelor’s degree say the same. In addition, Republican gun owners are more likely than their Democratic counterparts to regularly attend gun shows – 28% of Republicans and independents that lean Republican vs. 18% of Democrats and Democratic-leaning independents say they go to gun shows often or sometimes. When it comes to watching gun-related TV and video, visiting websites and attending gun shows, gun owners with multiple firearms are among the most likely to engage in these activities. Roughly half of gun owners with five or more guns say they watch gun-oriented TV or videos or visit websites related to guns and hunting at least sometimes. Significantly smaller shares of those with fewer guns do the same. Owners with five or more weapons are at least twice as likely as those with fewer weapons to say they attend gun shows often or sometimes. Relatively few gun owners listen to gun-oriented podcasts or radio shows – about one-in-ten listen often (2%) or sometimes (9%). Younger gun owners are more likely to listen at least sometimes: 21% of those under 30 say they do, compared with 9% among gun owners ages 30 and older. About one-in-ten gun owners say they often (1%) or sometimes (8%) participate in online discussion forums about guns. Again, younger gun owners are more likely than their older counterparts to participate in these types of forums – 22% among those under 30 vs. 7% for 30 and older. 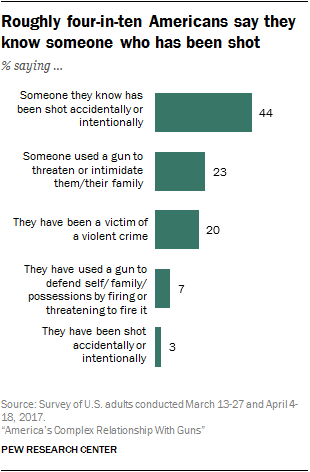 A significant share of Americans (44%) say that someone they know has been shot, either accidentally or intentionally. Some 3% of all adults say they have been personally shot either accidentally or intentionally. Gun owners are significantly more likely than non-gun owners to know someone personally who has been shot (51% vs. 40% of non-owners), and they are also more likely to report that have been shot themselves (6% vs. 2%). There are demographic differences as well. Roughly six-in-ten (57%) blacks, compared with 43% of whites and 42% of Hispanics, personally know someone who has been shot either accidentally or on purpose. There is also a divide by educational attainment: Roughly half of adults with a high school diploma or less say they know someone who has been shot, compared with 37% of adults with a bachelor’s degree or higher. Americans living in rural parts of the country are also more likely to know someone who has been shot. Half of rural residents know someone who has been shot. By comparison, Americans living in the suburbs and in urban areas are less likely to know someone who has been shot (40% and 43%, respectively). However, these differences largely evaporate among gun owners. Among urban gun owners, 59% say they know someone who has been shot. This is roughly equal to the share of rural gun owners who know someone who has been shot (53%). Overall, roughly one-in-four Americans (23%) say someone has used a gun to threaten or intimidate them or their family. Gun owners are no more likely to have experienced this than non-gun owners. There is, however, a significant racial gap. Roughly a third of blacks (32%) say someone has used a gun to threaten or intimidate them or their family, compared with 20% of whites. About a quarter of Hispanics (24%) say this has happened to them or their family members. Men and women are about equally likely to say someone has threatened or intimidated them or their family. Among men, those ages 50 and older are more likely than younger men to say someone has used a gun to threaten or intimidate them (28% among older men, 21% among younger men). Americans are much less likely to have ever fired or threatened to fire a gun to defend themselves, their families or their possessions than they are to have been threatened by a gun. Some 7% say they have had this experience. Not surprisingly, gun owners and those who have owned a gun in the past are much more likely than those who have never owned a gun to report that they have used a gun to defend themselves, their family or their property. Only 1% of non-gun owners who have never owned a gun say they have used a gun to defend themselves. Roughly one-in-ten (9%) of those who have owned a gun in the past but no longer do, say they have done this. 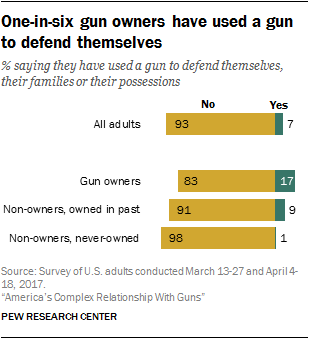 Among current gun owners, 17% say they have used a gun to defend themselves. The extent to which gun owners see owning a gun as part of their identity is strongly linked to experiences using a gun for self-defense. About one-in-five (22%) gun owners who say owning a gun is a very important part of their overall identity say they’ve defended themselves with a gun. By contrast, about half as many (12%) gun owners who say their ownership is not too important or not at all important to their identity have used a gun in self-defense. Looking at experiences with crime more broadly, one-in-five adults say they have been the victim of a violent crime, whether a gun was used or not. And roughly equal shares of gun owners (21%) and non-owners (20%) say they have had this type of experience.